Where will I be Boating? 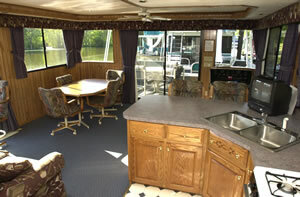 The extras we provide range from private sleeping berths, 1 1/2 and 2 full bathrooms, air conditioning and generators. All boats are equipped with color TV and VCR, AM-FM Stereo Radio, depth finder, marine radio, deluxe furnishings and interiors, wide body construction with oversized tinted windows. The boats are set up with executive wishes in mind.